The execution of legendary German bandit and mass-murderer Peter Niers took place in Neumarkt on this date in 1581 … or at least, it started on this date. No matter the plausibility discount we we might reckon for this sensational figure, it is verifiable that Niers was was an early modern public enemy for years before his death. He enters the documentary trail in 1577 when the first of several known crime pamphlets** about him hit movable type upon Niers’s arrest in the Black Forest town of Gersbach. Under torture, he copped at that time to 75 murders … and then he broke out of captivity and into the nightmares of every German traveler wending gloomy highways through the unguarded wilds. Actually “rather old,” according to an arrest warrant, with crooked figures and a prominent scar on his chin, the fugitive Niers gained an outsized reputations for disguise and ferocity. As Joy Wiltenburg describes in Crime & Culture in Early Modern Germany, that Niers of fable became like Keyser Soze “assimilate[d to] various supernatural elements” that elevated the crafty gangster into a shapeshifter or magician powered by a demonic patron. The roving killer Peter Niers and his gang appeared in a number of accounts, several without demonic content. Johann Wick followed Niers’s career with horror; his collection includes three pamphlets on his misdeeds between 1577 and 1582. 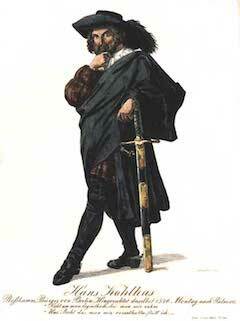 Niers was arrested and tortured in Gersbach in 1577, confessing to seventy-five murders. According to a song pamphlet from 1577, he learned the art of invisibility from an earlier arch-murderer, Martin Stier. (Wick also owned an account of Stier’s misdeeds and added a note in the margin of the Niers pamphlet, cross-referencing Stier’s 1572 execution in Wurttemberg.) Both Stier and Niers confessed to killing pregnant women. Each had also ripped a male fetus from the mother’s body, cut off its hands, and eaten its heart. Niers evidently escaped in 1577, to be rearrested in 1581 and this time finally executed. According to the pamphlet account, he was caught only because he was separated from the sack containing his magical materials and so could not turn invisible. Here the capture is considered an act of God, but the Devil gets no explicit credit for Niers’s evil magic or his 544 murders, including those of 24 pregnant women. Only the final pamphlet, printed in Strasbourg in 1583, fully explains the diabolical reason for the mutilation of fetuses. Here, the Devil makes an explicit pact with the killers and promises them supernatural powers from the fetal black magic. He must have been a few fetuses late by the end, for it was his disguise that failed him when he slipped into Neumarkt in August 1581 intending to freshen up at the baths. Instead, he was recognized and arrested. His body — already put to the tortures of pincers and oil — was shattered and laid on the breaking-wheel on September 16, 1581, but it was two agonizing days before this terror of the roads finally breathed his last. * 500 murders sounds like plenty to you, me, and Ted Bundy, but it wouldn’t have even made him the most homicidal German outlaw executed in 1581. ** A 1582 print reporting Niers’s execution is available online here. June 17 of 1581 was the alleged condemnation date — the best specific calendar date we have — for the German robber/murderer Christman Genipperteinga or Gniperdoliga, who was broken on the wheel for a reported 964 murders. 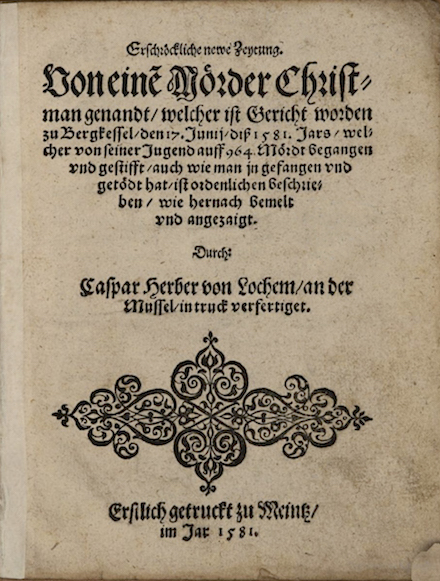 A 1581 pamphlet “Erschröckliche newe Zeytung Von einem Mörder Christman genandt” is the earliest account we have of our inaptly named Christman (German Wikipedia entry | the surprisingly much more detailed English), and even this first source supplies us the seemingly outlandish body count. Our man is supposed to have made a lair in the Rhineland wilds from which he preyed on German and French travelers, and even turned murderer of other bandits after partnering with them. It was in the 1570s that reports of robber bands multiplied, reaching a peak in the 1580s and continuing in lower numbers into the seventeenth century. Accounts of such activity were far-flung, from Moravia in the modern Czech Republic to Lucerne in Switzerland and from Wurttemberg in southwestern Germany to Bremen in the north. Although violence and malevolent magic were the most sensational aspects of the bands’ reported activities, stealing was central to their existence. Even among these ubiquitous broadsheet outlaws, Christman Genipperteinga’s near-millennium stuck in the public imagination. Genipperteinga cannibalizing his victims, including his own infants. And, Genipperteinga having literal supernatural powers (invisibility, congress with dwarven artificers). For a larger-than-life criminal, a longer-than-death execution. The story goes that our Christman endured nine agonizing days on the breaking-wheel, his tormentors fortifying him with hearty drinks every day in order to prolong his sufferings. There is some evidence that the swell in crime reports in the later decades of the sixteenth century coincided with a time of generally intense prosecution. According to figures compiled by Gerd Schwerhoff, a number of localities had especially high levels of execution in this period. Augsburg, for example, shows a distinct rise in the proportion of criminals executed in the last four decades of the sixteenth century — double or more the proportions of the preceding and following periods. Nuremberg too had a substantial rise in the last decades of the sixteenth century, with lower numbers before and much lower figures by the mid-seventeenth century. Zurich similarly executed a much higher proportion in the sixteenth century than in the fifteenth or the seventeenth, although its figures are not broken down by decade. 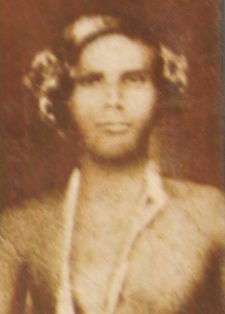 Ceylon social bandit Utuwankande Sura Saradiel (or Sardiel) was hanged by the British on this date in 1864. Saradiel fled a barracks servant’s life to take the road as a bandit. He’s alleged to have gallantly shared his proceeds with the poor; what he unquestionably did was tweak the tail of the powerful (and in this case, colonial) overlords. As is often the case with social bandits, it is difficult to know for certain whether it is for reason the latter that he enjoys the reputation of the former. Naturally, there is always a Sheriff of Nottingham. 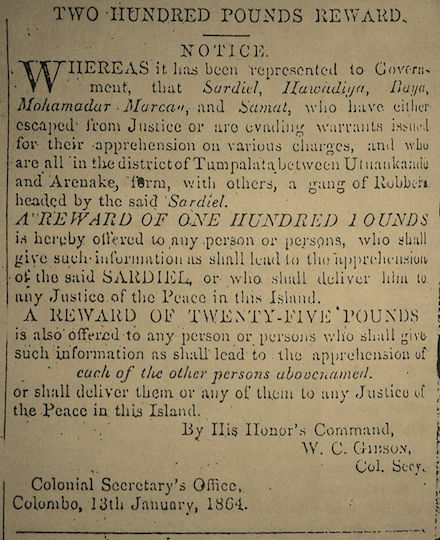 Reward notice for the capture of our man, from the Ceylon Gazette of January 13, 1864. Saradiel cinched his fate by shooting dead a constable in the course of his arrest. Considering that circumstance, we here at Executed Today are officially skeptical of the legend that a misplaced comma — “kill him, not let him go” when “kill him not, let him go” was intended — decided the man’s fate. * The best one is that, having robbed from a father what he later learned to be the dowry for a bride-to-be, the robber found his victim again to return the sum, compounded by gambling winnings. Heart of gold, this guy! On this date in an unspecified year, the bandit Vilem is broken on the wheel and beheaded in the classic Czech poem Maj, by Karel Hynek Macha. This tale, recognizable to every Czech, has been put to the silver screen on several occasions. Macha’s timing was impeccable, for he self-published it in 1838, right when central Europe’s romantic social banditry mythos was forming. According to Mohmir Grygar, the name “Vilem” (Wilhelm, William) might allude to the executed Tyrolean chancellor Wilhelm Biener, although Biener himself — a fallen overmighty politico, not a gold-hearted brigand — bears little resemblance to his alleged literary descendant. The twilit May—the time of love. To love-songs of the nightingale. Like burning tears the lover weeps. In the high rapture of reunion. A rosy halo round her thrown! And of self-love, beholding, died. Grown all one twilight unity. Tree in the shadows writhes to tree. Pine leans to birch and birch to pine. Wave baunting wave the streamlets move. Anguished goes every living thing. Far out across the lakes she gazes. In clear, pale light all melts and shimmers. Only the glint of starlight plays. In her pale cheeks doomed beauty hastens. Marries her May to grief and sorrow. Still dreams the quiet countryside. Over the deep blue mountains flushes. “He comes not! Ah, such anguish takes me! Mingles the note of bitter weeping. On her cold countenance briefly glowing. And where they fall, the blossom fades there. In evening zephyrs fluttering lightly. Star after watery starlet bastens. But a white sail rocked by hasting breezes. With flaming furrows the surface bazing. Gilds the ripples with rosy gold. “Swift litlle boat! Near, nearer bounding! His cloak—” The boat in the beach is grounding. By a known path he climbs and closes. In its full flood a face she knows. Her pounding blood to terror knells her. Tomorrow sets him free from living. That stroke a parricide arraigned him. Still, still revenge the avenger barries! And in the wheel his limbs are twining! So dies the dreaded Forest King! Outward his boat goes gliding. Over the lake in the mountains hiding. In deep dusk all things crouch to cover. And the woods sigh: “Jarmila!” over and over. The twilit May-the time of love. Beats at heaven with bitter breath. Nowhere—never an end of death. Beneath, the whispering wavelets quiver. The argent moon sheds radiance. And dims into the assault of night. And stirs the prisoner’s tresses. To deeps of thought his soul resigning. Thought into thought flows undesigning. And friends weep for my end there. Weep?—and for me? A dream outworn! Long since I have no friend there. And into darkness stills there. The long-lost life of a boy light-hearted. A lost world how shall the seeker find? He dreams himself once more a child. Gallant and daring they acclaim him. Lord of the Woods, a name of fear. His stranger father strangely slaying. At the first kindling of the hills. Thought evermore new thought disclosing. “He, sire and foe!-I, death and seed! And he my love’s betrayer! recoiled and slew the slayer. The lawless woods to barry? Whose crime does the dawn’s death requite? Whose guilt is this I carry? So soon-and, ah, for ever? In iron grip shuts sound and sight. A new dream holds his mind in thrall. “Ah, she, my saint, my rose embowered! Why lost ere ever she was found? Why at my father’s hands deflowered? Over the waves his tortured sight. That flash and fade in waters hollow. And all his heart is wrenched with pain. “How fair the world! How rich the night! On all the bliss of seeing! In blackest marriage earth and heaven. The song of heaven distilling. Finds Lethe in its sweetness. On the night’s breast you’re flinging! “Time yet to come? Tomorrow’s day? Or sleep too deep for dreaming? Will dawn and death disclose? On all the earth is draped there. As if the grave’s mouth gaped there. Dead silence, utter darkness dwell. “How deep the night-how dark the night! The grave his thought discloses. “How long the night—how long the night! Of slow drops falling metes out time. Only the dark for ever. For there time passes never. Who shall my soul deliver? He faints, he falls aquiver. Who in a deep half-death is lying. The prisoner’s trance of dread unresting. On all beyond lies dreaming. Tells forth tormenting dreams of death. Out of his shut lips sighing. And on the prisoner’s face it glows. For speech his lips contend in vain. The prisoner’s tale of blood and tears. Speech, as if sleep came unawares. Sorrow his heart within him sears. Out of the cell he flies in haste. His pale lips said farewell to laughter. The guard is fled, fast-closed the door. Tears, sweat and blood his pallor stain. To Vilem’s ear of death they tell. He faints beneath the thought appalling. And louder beats the midnight bell. Darkness is on the hills, the lake with stars is bright. About the high wheel revelling rightly. Beside his own cross keeping ward. “This is the hour! The place prepare! Inherit life – a voice receive. No more be doomed alone to dwell. In one whole creature, only one! What is this rout of terror and pain? “His place of honour ready see! The storm shall bear us here once more. Fly, voice, across the fields with power! At midnight is the funeral hour. His votive gift let each make known! “All honour to his grave we pay! Like mist lies long the dream of May. The highest peak stands towering. And joy possesses everything that lives. Pattern the dim blue waves with glancing, fiery scallops. As all that lives draws breath to praise the youthful May. And to its touch young trees unfold their eager growing. Deep in the waters green in quiveringly laid. As from the gates of the town the hungry man-pack races. The unhappy felon comes, led forth at dawn to die. Whose old, proud habit soon the eager watchers spy. As with a heavy step the criminal draws near. Slowly the doomed man goes, his gaze to earth is given. The town bell tolls; the crowd pities and falls to prayer. And on the higher point a chapel gleaming whitely. Now all men move aside—the felon stands alone. Where the lost coin was spent, the golden childhood days. To the lord of heaven and earth his reverence he pays. And deep compassion folds its hands on every heart. A murderer praising God in the humbled hush of prayer. A last love-tryst are keeping. Nursed in the flowering valley drowses. Dimpling the sunlit lake-shore lie. Far in the hills retreating. Oh, fair lost hour and fleeting! The column an the wheel appearing. The morning dew—the morning May. Then to the sky his tear-dimmed eyes he raises. White cloudlets over the placid sky go glancing. Bear you my charge, of all things that have birth. There, pilgrim clouds, greet reverently the earth. There fails his voice, the strangling tears have slain it. And now the multitude is hushed indeed. The executioner with his sword stands ready. And on the approaching death his soul makes steady. And falls the body after, one with the grieved earth growing. Into the earth, so beautiful, so beloved. Into the mother’s heart the blood of her son is flowing. And over the wheel his head, a blind, oblivious thing. So died the lord of the woods, the dreaded Forest King. On the dead countenance the last dream lingers still. Into the head’s blind eyes its gay last laughter sending. Hushed is the broad lake-hushed is the evening shore. Above the far dark hills the last radiance blazed. As in the evening hush the moon’s fair face is raised. To the edge of sight, to his youth-Oh, brief, bright childhood day! Time in its headlong flight has carried that Spring away. Are the dead years of the dead, their beautiful childhood time! Taut from one peak to his brother. Dark and silent as the tomb is. Shuts this gate of rocks and boulders. Till the blue of night they borrow. And the earth to grief is given. Hide a company of friends there. Sit the comrades of the night-time. Into stone their flesh had stricken. As time bears off the years on its unresting wing. A new year would be born. The cold earth dreaming lay. Lone hoof-beats by the lake troubled the silent time. There first I saw Vilem- a bare skull glistening white. Over the skull and wheel-all white without a shadow. So that my horse and I with panic dread were stricken. The story I have told-and on that wheel impaled me. Till in a young Spring season home to the mound it led me. Even to the misty rim where earth and heaven blended. Where rich and sweet the pinewoods lay. As brother sister in their playing. On fretted skin and white jaw glowing. His dead eyes brim with tears of sorrow. Over the vales and woods to the distant hills that bore him. Like fiery falling tears, all his spent tears embowering. Time in its headlong flight has seized and borne away. But what of following time? My youth, alas, my youth! My season and song are May! Light laughter on the lips, deep grief in the heart’s core. Through the long, sunset fields, beneath the dimming west? As over the edge of vision he falters and finds no rest. Never-ah, never! And this is all life offers me! Comfort? Who comforts me? What charm this heart can move? Love is without an end!—And bitter is my love! I have killed hundreds with my own hands, and I know how to die. Fire! A monument to Roberto Cofresi rises from the water in his native Cabo Rojo. On this date in 1825, the Puerto Rican pirate Roberto Cofresi was publicly shot in San Juan with his crew. The family of “El Pirata” — his father was an emigre who fled Trieste after killing a man in a duel — bequeathed him the upbringing and honorific (“Don”) due to a gentleman without any of the money. Dunned by multiplying creditors, he took to the sea to keep his finances afloat and for a time made a legitimate living in the late 1810s as a piscator and a ferryman. Soon, the crises in Puerto Rico’s economy and governance prodded him into more adventurous pursuits, beginning with highway robbery around his hometown of Cabo Rojo. Wanted posters testify to his landside notoriety; soon, he would combine his vocations as a buccanneer. In his brief moment, about 1823-1825, he became one of the Caribbean’s most feared marauders, and one of the last consequential pirates to haunt those waters. His career plundering prizes and evading manhunts is recounted in surprising detail on the man’s Wikipedia page, which is in turn an extended summary of an out-of-print Spanish-language book. Given the development of maritime policing by this point it was an achievement to extend his career so long … but everyone has to retire, one way or another. 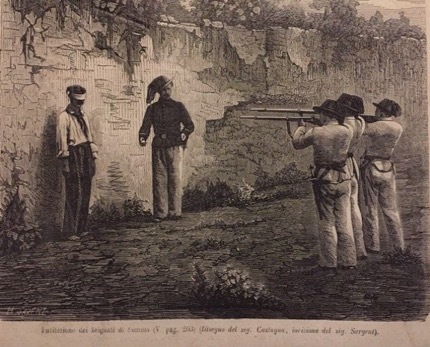 The name of Roberto Cofresi has become famous for robberies and acts of atrocity, and neither the countryman, the merchant nor the laborer could consider himself secure from the grasp of that wretch and his gang. If you ought to pity the lot of these unhappy men, you are bound also to give thanks to the Almighty, that the island has been delivered from a herd of wild beasts, which have attempted our ruin by all the means in their power. You are also bound to live on the alert, and be prepared, in conjunction with the authorities to attack those who may hereafter be so daring as to follow their example. His throwback profession, his acclaimed charisma, his talent for eluding pursuit, and a purported streak of Robin Hood-esque social banditry all helped to make him a legend that has long outlived the forgotten Spanish agents who hunted him. With his threat to the sea lanes long gone, he’s become a beloved staple of literature, folklore, and popular history in Puerto Rico and especially his native Cabo Rojo. Again, a lovingly curated Wikipedia page on this posthumous career awaits the curious reader. 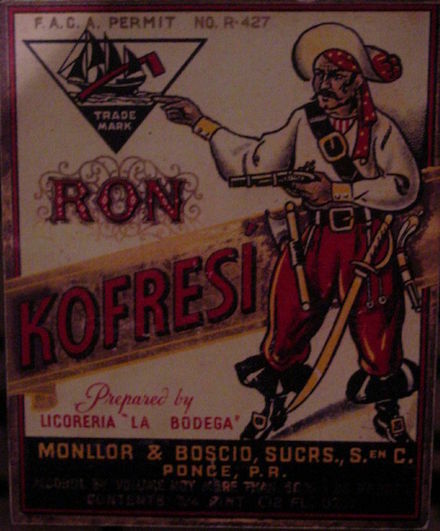 Label for a Ron Kofresi-brand rum, which one might use to toast his memory with a piña colada: it’s a drink he’s alleged to have invented.